The original Darksiders was an unusual success in that it combined elements from a variety of different games to create something that felt surprisingly good, if not fresh. Using the Legend of Zelda dungeon-crawling pseudo-RPG format as a base, it told an engrossing and thoroughly metal-inspired tale of the end of days, in which the first horseman of the biblical apocalypse, War, is a accused of triggering Armageddon early and causing the extinction of mankind. The ensuing adventure followed War’s quest for redemption and his discovery of a conspiracy involving both Heaven and Hell that threatened the balance of the universe. Standing on well-executed God of War-esque gameplay and an art style by the accomplished comic book artist Joe Madureira, Darksiders rose from the ‘above average’ bracket it might’ve otherwise occupied and established itself as a force to be reckoned with. 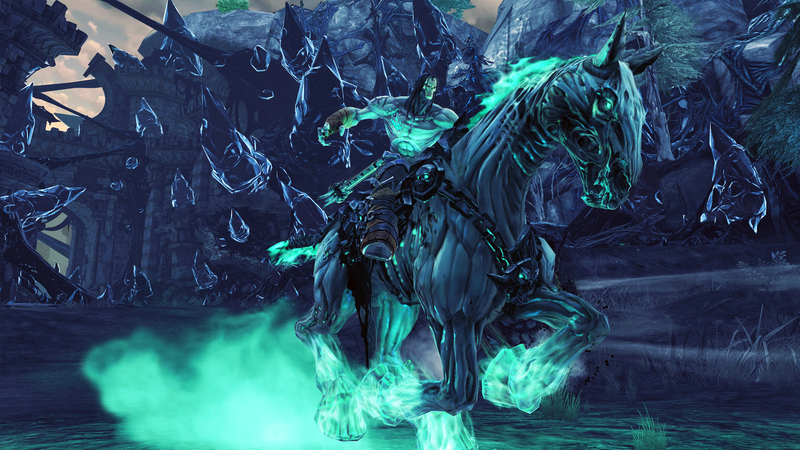 Thus, in 2012 (ironically enough, given the game’s apocalyptic themes), Vigil Games produced Darksiders 2, a sequel whose story ran alongside that of the first game and followed the adventures of the Pale Rider, Death. The game won considerable acclaim, repeating the success of its predecessor while expanding the scale of its world by several orders of magnitude. 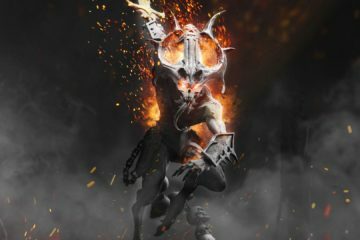 Were it not for the financial woes of THQ, owners of Vigil Games and by extension, the franchise as a whole, we might’ve seen a Darksiders 3 far sooner. Unfortunately though, the company went under soon after the game’s release, with the IP being purchased by Nordic Games. It was expected that the saga of the Horsemen would end there, but thankfully it was not to be. Three years after the game’s initial release, Nordic Games announced the release of the oddly-titled Deathinitive Edition, as a prelude to a potential continuation. This compendium version of the game incorporated all the previously-separate downloadable content and raised the aspect ratio to the more modern standard of 1920 by 1080 pixels. It stands as a road-mark on the map towards Darksiders 3, and a gift to all the fans of the original for their dedication. ​However, with the third installment finally on the horizon at the time of this writing, it’s more important than ever to take a good look at the series. Does the Deathinitive Edition retain the charm of the original? 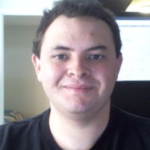 Have the changes improved anything? Is it still worth buying? If you decide the answer to that last one is ‘Yes!’ by the end of this article, then you can find it in the Steam store for just $29.99, along with the soundtrack, if that interests you, for a mere $4.99 extra. For now though, let’s take a look at Darksiders 2 as a whole. 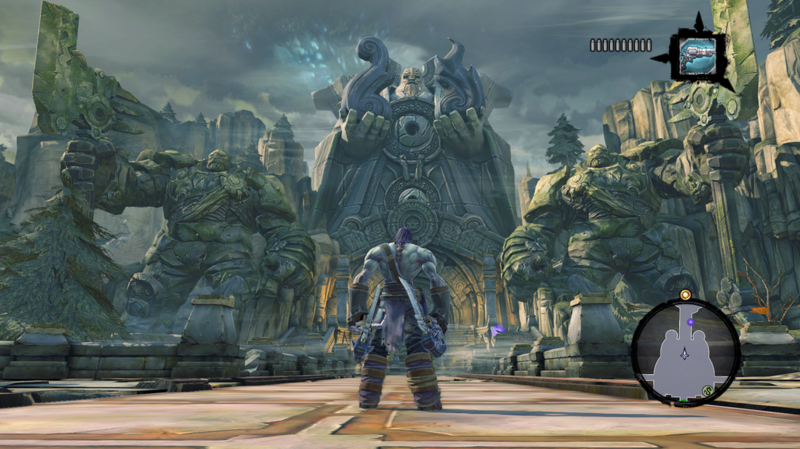 As previously stated, Darksiders 2 follows events that run parallel to the story of War in the first game. Death, the fourth and most powerful rider of the Apocalypse, sets out to redeem his brother by resurrecting humanity, thus nullifying the crime. The game starts with him riding out to meet the Keeper of Secrets, a reclusive figure who he thinks might be able to help. As the plot progresses, the history of the Horsemen as a group comes into play, while the narrative universe initially created by the first game is fleshed out. I enjoyed this world-building quite a bit, as it doesn’t stick too heavily to scripture for its lore, and overall has a feel that can only be described as ‘metal’, in that it has the feeling of epic events and scale bound up in raw badassery. Unfortunately, the main plot itself, while cool in concept, lacks the urgency and snappiness of the original. This is probably because the game’s world is so much huger than that of the first Darksiders, resulting in a conflict of length versus content. If often feels like the story is trying to be as quick-paced as War’s story, but is being stretched out over a length of time and space that should really have a deeper, more complex plot. Sadly, it’s entirely possible that this is a result of the developers running out of time. Evidence of this can arguably be found in the DLC dungeons, which unfortunately remain divorced from the main campaign and must be access via the loading menu. Needless to say, this is incredibly irritating, especially given the amount of effort obviously put into generating an atmosphere of immersion, and the fact that these extra areas could’ve easily been tied in with just a bit more effort on Nordic‘s part. Argul’s Tomb in particular seems like a missed opportunity, since it’s narrative is linked to two major background characters. Sadly however, it seems that Nordic took the easy way out, limiting themselves to minor changes for the sake of time and money. It’s understandable, given that the Deathinitive Edition was probably conceived as a test of how much interest still existed for the franchise as a whole, but it’s still disappointing. All that said though, Death is still more interesting and developed as a character than War (not exactly a difficult feat, but hey, it’s not about tugging on heartstrings), and the environment around him tells most of the story in any case. 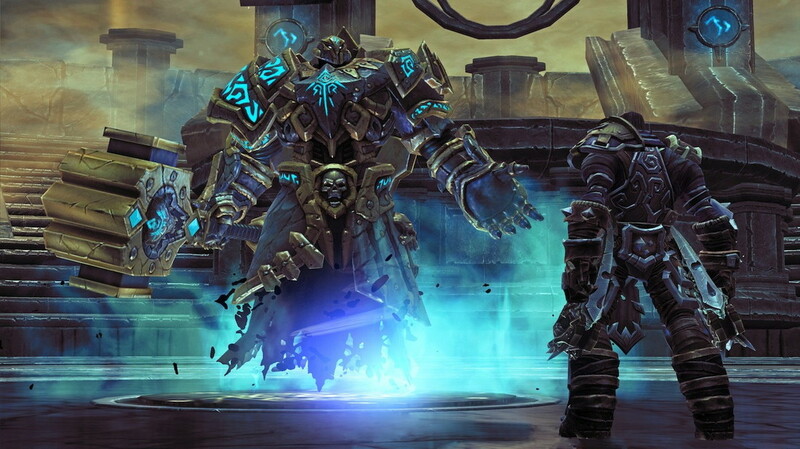 As a sequel Darksiders 2 is about building on the universe created by its predecessor, trusting in massive set-pieces and visual storytelling to create a world of what might be termed as biblical science-fantasy, a place where angels, demons and all manner of creatures live and fight and have histories you can only speculate at. All in all, it’s a vibrant, colorful adventure that’s also coincidentally about redemption and atoning for past sins. When it comes to the actual experience of playing, Darksiders 2 takes everything that worked from the first game and spices it. As many reviewers have noted the fighting is reminiscent of God of War with emphasis being placed on juggling enemies and landing consecutive strikes. Unlike War, Death is more agile and nimble, allowing him to dodge and side-roll to bypass incoming attacks. He also cannot block attacks, making this new speed and maneuverability your only defense against the swarms of enemies you’ll face. Overall it’s not exactly anything that hasn’t been seen before, though the addition of a loot-drop system featuring gold (gilt in the game’s terms) and randomized items does mix it up, giving Death the ability to wield a variety of scythes and secondary weapons ranging from spears to arm-blades. On the subject of the loot system, it should also be mentioned that the game does take some creative risks in its implementation. For example there’s also a special class of weapon termed ‘Possessed’, which is something handy you’ll want to hang onto when you get it, since you can feed it useless items to increase its stats, essentially allowing you to custom-build your own weapon with enough care and experience. The Deathinitive Edition also includes all the legendary DLC items that were originally sold separately from the base game, scattered throughout the main campaign and New Game + for the determined player to locate. It’s one of the more significant alterations Nordic Games made, and it’s something that anyone who hates micro-transactions will be happy to see. 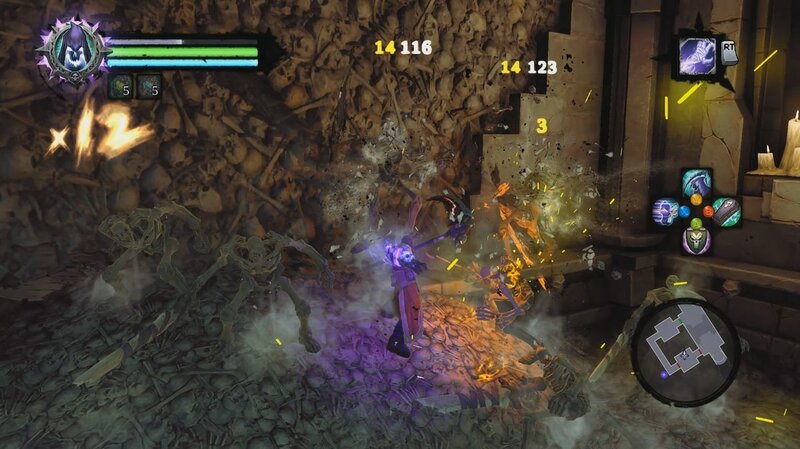 Of greater note is the inclusion of a two-sided skill tree which allows Death to invest skill points earned from leveling up in new powers, such as the ability to summon ghouls to distract his foes or perform a teleporting slash to bypass incoming attacks. These powers are fueled by Death’s Wrath gauge, a meter that fills back up based on chaining strikes to foes, resulting in a very interesting mix of magical mayhem and murder as you freely combine abilities with combo-laden assaults. Added to the gear that Death gets later in his voyages, such as a pistol called Redemption and a long-range grabbing power much like the Abyssal Chain from the first Darksiders, and the battlefield starts to feel full of options, which is just as well, since you’ll need them all. Beyond the combat, the heart of the game lies in it’s dungeon-crawling elements, to which there’s a heavy element of puzzle solving that again hearkens back to the Legend of Zelda series. The button pressing and lever-pulling is also accompanied by a whole lot of level architecture designed to show off Death’s skills at acrobatics, with wall-running, beam-climbing and ledge-hopping all much in evidence. It’s all very fun and engaging, making you feel like you’re really digging in and exploring the various dungeons that have been laid out for you. The open-world design of the zones in Darksiders 2 are full of secrets and side-areas to delve into for extra chests full of loot, among other things. In this manner, it’s far more expansive than the original, with many areas encouraging back-tracking once you get new abilities later on. Of course, some powers get more attention in this way than others, like the previously mention long-range Death-Grip power, which serves a purpose outside combat in that it allows Death to seize onto and swing from special hooks on the walls and ceiling. Meanwhile, items like the Voidwalker and its time-traveling cousin, the Phase Walker, only really remain useful in the latter half of the game’s content, which is just further evidence of the budget constraints Vigil Games had to deal with. While it would be quite out of the ordinary for Nordic Games to step in and correct this, especially for a mere compendium edition of a game as old as Darksiders 2, it would’ve been nice to get some more mileage out of the old magic portal gun and other such tools. On that note, it’s also important to point out that while the immensely-increased scope of the game’s landscape is a boon to its replay potential, it also has its drawbacks. The game’s world is divided into four major zones that unlock as the story progresses, and which are so vast that riding around on Despair, Death’s mighty steed, is almost a necessity. This is very cool, since it’s not something you got to do as much of in the original Darksiders, with War only getting his horse Ruin back about halfway through the game. Unfortunately, riding around the world is fun, but also a tad slow, and the experience is hampered somewhat by the inclusion of a fast-travel system, which truthfully makes sense given the game’s desire to be fast-paced. However, it also suffers from a lock-out bug that requires you to reboot the game to resolve, and in some cases it just detracts from the immersion the world is obviously trying to instill. Also most people will probably agree that reaching the end of a dungeon only to discover you can only leave by teleporting out using the over-world map stinks of poor level-planning. Ultimately if there’s one thing Darksiders 2 suffers from more than anything else, it’s repetition. There’s too much reliance on collectible-based quests as a means of encouraging backtracking, and gathering three of something happens so often it begins to reek of a lack of imagination. This may be a bigger problem for some people than others, but it’s still worth pointing out, since it’s probably the one place where Vigil Games had no one but themselves to blame regarding missed opportunities. They might’ve had some bigger plans, but unlike many other things in the game, this is one place where there are no loose ends to tug on. Setting that aside though, there’s still enough vigor in the adventure and the combat itself to warrant trying New Game + once you complete the main story. Sadly, Nordic Games goofed again here by allowing the limitation of only one New Game + playthrough per save file to remain intact, but they made up for it somewhat by including a new fifth tier of difficulty called Deathinitive (tougher even than Apocalyptic, if you can believe that). Also contributing to replay value is the Crucible, an arena where Death can fight waves of enemies for ever-increasing rewards and the right to appear on some shared scoreboards. It’s not much, since the Soul Arbiter’s Maze (a secret dungeon found in-game) is already pretty much like this, but it does offer a challenge for those seeking it once they’ve triumphed over everything else. Granted, Darksiders 2 wasn’t and isn’t the first to use the features that it employs. It’s efforts to introduce more RPG-like elements such as a loot system and a skill tree are somewhat hit and miss when taken overall, but on the whole, they contribute nicely the combined experience well enough that whatever flaws they possess can be overlooked. 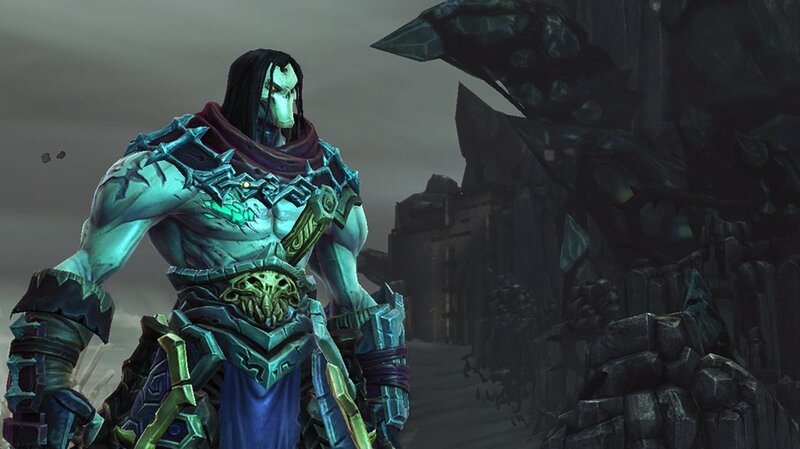 Unfortunately, while the Deathinitive Edition retains everything that made the original Darksiders 2 good (and bad), its own share of problems that it adds. Despite all the work that went into upgrading the textures and graphics for a modern audience, the game suffers from numerous bugs, including the odd crash to the desktop. On some occasions, the audio will cease working entirely, forcing a restart. Granted, the base version of Darksiders 2 had its own problems, some of them worse, but given the fact that this was supposed to be a re-release aimed at getting people interested in the franchise again, and how smoothly (for the most part) the original ran on PC, its hard to forgive Nordic Games for not putting the extra time and energy into optimizing the experience for returning and new players alike. Of particular frustration was the fast-travel system, which often became stuck and refused to work when called upon, again forcing a restart to resolve the issue. Apart from these humdrum software issues, which while aggravating aren’t quite enough to detract from the overall experience, Darksiders 2 remains a glorious journey through a vast open world…at least at the start. One of the major drawbacks that can definitely be attributed to the budget-crunch the game was developed under is the fact that the game front-loads most of its content. Compared to the initial sections offered in the Kingdom of the Dead and the Maker’s Vale, the latter half of the game lacks much of the sheer scale and depth that the former does. There are almost no side-dungeons to explore apart from the DLC after passing the midway mark, and while there’s a great deal of backtracking for the sake of collectibles, it’s not balanced out by that sense of discovery that comes with exploring new terrain, making it feel mostly like a slog through puzzles you’ve already solved. Overall though, Darksiders 2 lacks for nothing in terms of basic content from an aesthetic perspective. The combat sounds and feels snappy, with Death dodging and rolling while whipping his twin scythes about like a combine harvester powered by flashy magic. Meanwhile, the artistic powers of Joe Madureira lend the world a serious heavy-metal vibe on a par with the crazy pseudo-Norse and Gothic architecture of Brutal Legend, but without all the over musical references. Each area feels very distinct, with its own color palate and eye-catching set pieces which range from the absurd, to the monumental, and to the monumentally absurd. One good example is the Eternal Throne, a massive floating structure pulled chariot-style through the land of the dead by a pair of colossal, serpentine Leviathans, each beg enough to squeeze an aircraft carrier into junk in its coils. Everything about the world is just so jaw-dropping that it’s hard to find things to complain about (though the skull motif could use a bit of a rest). Despite bringing little to the table that wasn’t already there, the Deathinitive Edition does enough right that it manages to balance out whatever fresh problems it brings. It’s still the same Darksiders 2 experience, just without the paid DLC and items sold separately, and with a fresh coat of paint. If you enjoy character-action games and RPGs, it’s definitely worth your time and money, especially since as of this writing, Nordic Games, now re-christened as NordicTHQ, have announced their work on a sequel that many thought might never appear. Until that happy day of release, however, Darksiders 2: Deathinitive Edition remains a worthy addition to any collection. So what are you waiting for, Horseman? The seals are broken! Ride hard…and may hell follow with you!